Riding a horse is a fun thing to do! 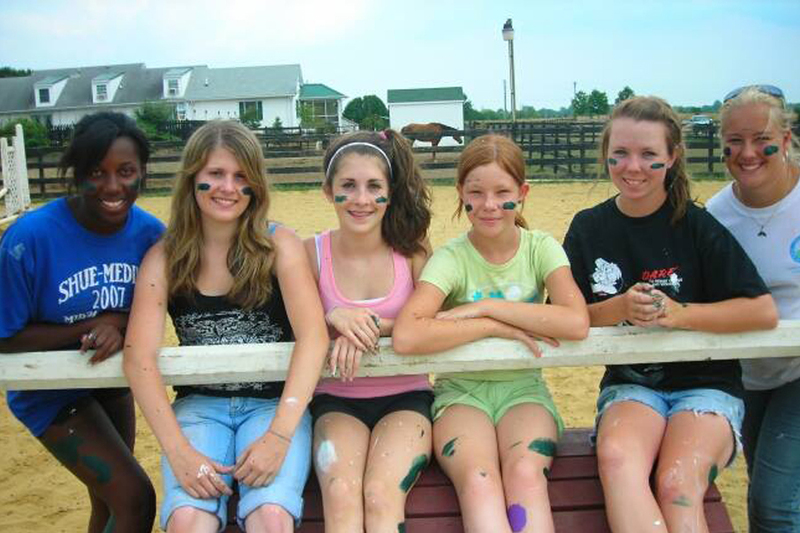 Over the summer, girls and boys (ages 6-15) have that opportunity daily at Deer Antler Riding Camps. Each camper receives lessons individualized to his/her riding level. No previous riding experience is required. Camp not only introduces beginning riders to horses and horsemanship but also enhances the riding skills of intermediate and advanced riders. At the end of each camp week, riders participate in a horse show for their families. Horses are fascinating animals. Caring for a horse provides campers with hands-on learning. Here they learn all about the horses characteristics, behavior, personality traits, health and nutritional needs, and how to use and care for equine equipment. The camp emphasizes safety procedures and respect for the size and strength of the horses. The campers will take part in age appropriate games, crafts and activities, to ensure that it’s not all work and no play! Occasionally special sessions are scheduled for more experienced teen and adult riders who are able to jump two feet and higher. Clinic style instruction provides advanced techniques for improving riding and jumping. Topics include hunter, jumper, cross-country and working with green horses in a setting where riders may bring their own horse or ride one of ours. Long pants, hard-soled shoes with a heel (no sneakers), and an approved riding helmet are required. Beginners may borrow a helmet. Bring lighter clothes to change into after riding, if you wish. Bring a bag lunch. Beverages are available from a soda/juice machine or bring your own.